As soon as we arrive back in Spain, a trigger goes off in me and I immediately crave everything beef and pork related. Chuletón de Buye on the bbq…check! Naturally ham is next on the menu…and so the cycle begins. As you well know by now, my no-recipe, recipes are first and foremost SIMPLE. Well, tasty probably takes precedence, then simple…but then again, if it’s not simple, it’ll never get to “tasty”. Hm, what came first, the chicken or the egg? Nevertheless, this is another one of our easy pizza creations. Again, we used store-bought pizza dough. 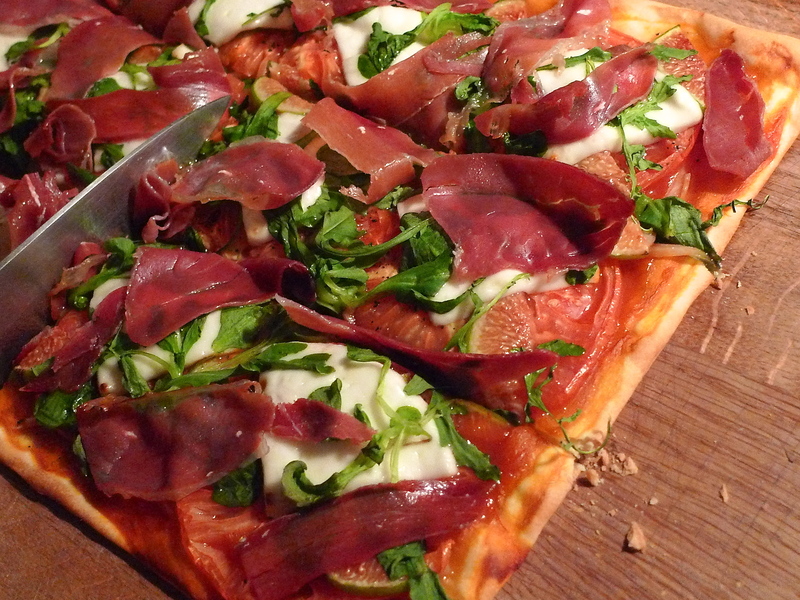 This time it’s from Buitoni – it’s our favorite ready-made thin crust dough that is available here in Marbella. Don’t hate the ready-made, just appreciate the ease and it’s still better than all frozen and most delivery. Speaking of which, I’ve touched upon something that I must share with you. You better sit down for this one because I was blown away when I learned of this little tidbit. Pizza delivery where we live in Marbella is practically non-existent. Talk about turning my world upside down!! No picking up the phone to order a hot cheesy pizza, to show up at my doorstep 45 mins later?!? Can you imagine?! Crazy! I know. Marbella has a few pizza places that deliver, but they’re extremely limited in their delivery area (namely, not where we live), hours and, most important, quality. Therefore, we make our own pizzas the entire time we are here. Luckily, we enjoy it. But the lesson here? Do NOT take your pizza delivery availability for granted! Ok, back to the good stuff. 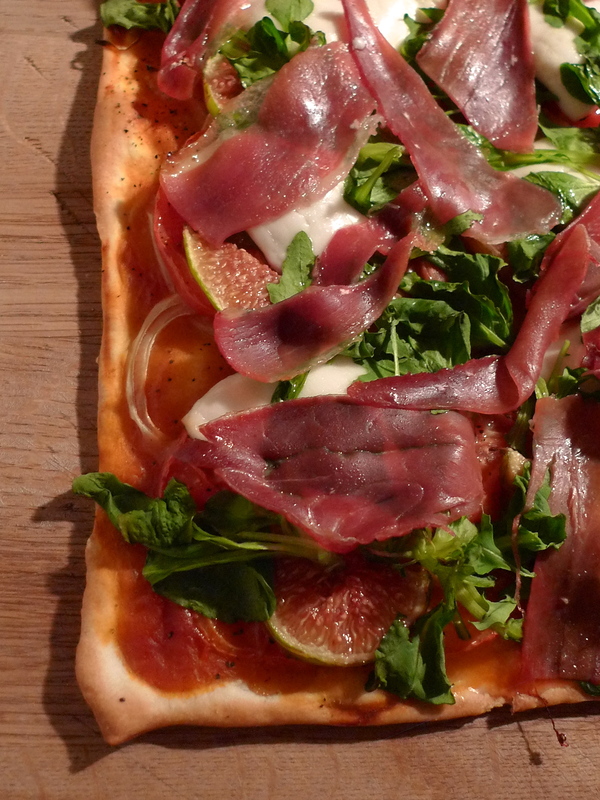 After rolling out the dough, we topped it with a light layer of tomato sauce, thinly sliced heirloom tomato, figs, slivers of onion, cheese, serrano ham and arugula. The delicate toppings – such as the ham, fig and arugula – add those at the very end, just to heat through. But let me rewind for a second. The cheese. Not just any cheese…we used, queso fresco de cabra (fresh goat cheese). Queso fresco is a mexican “fresh cheese” and is very mild and light. We were hoping for a more traditional crumbly goat cheese to accompany our fresh figs, but this is what we could find this time around. It still made a wonderful, light and bright pizza. The only down side was there were no left overs. making “your pizzas” for myself, muchas gracias! Yay! Just use the store bought crust and then it’s so easy and fast. The Trader Joe’s dough is quite good and it shows all of the ingredients used (to check for your allergies). LMK how it goes, send pics! That is one awesome looking pizza! Cool blog! I was drooling over at your site, so from another “experienced eater” to another, thank you! And quick and easy! Thanks for dropping by and commenting!